Login to enter an obituary or manage your account. Register to request access and setup your account. Login to view your obituaries or manage your account. Contact us for help entering an obituary or ask about bringing Direct Obits to your area. Important news and information is delivered instantly on your local TV News and Web Sites. And now, obituary notices are delivered with the same immediate attention. 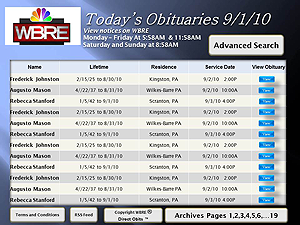 With the help of your local Funeral Director and participating TV station, families place an obituary on your local TV News and it is broadcast that very same day. Daily obit notices are broadcast during a dedicated obituary news segment. Notices air several times each day and for two or three consecutive days (depending on the market). Full obituary information is available by clicking the obituary link on the home page of the TV Web Site. From there, you can print the full obituary in a format suitable for framing or send the notice as an attachment to everyone on your email list or social network. Communications has changed dramatically in 150 years and finally obituary notification has caught up with the times. TV obituaries cost a fraction of newspaper notices. Your loved one’s obituary is received by every person viewing your local TV news; not just the few who still read the local paper. 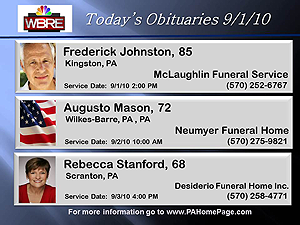 Honor your loved one during the daily obituary news segment of your local TV news. For more information contact a Direct Obits Representative by clicking the contact button above.